When it cleared up it really lifted our spirits after 16 hours of walking. 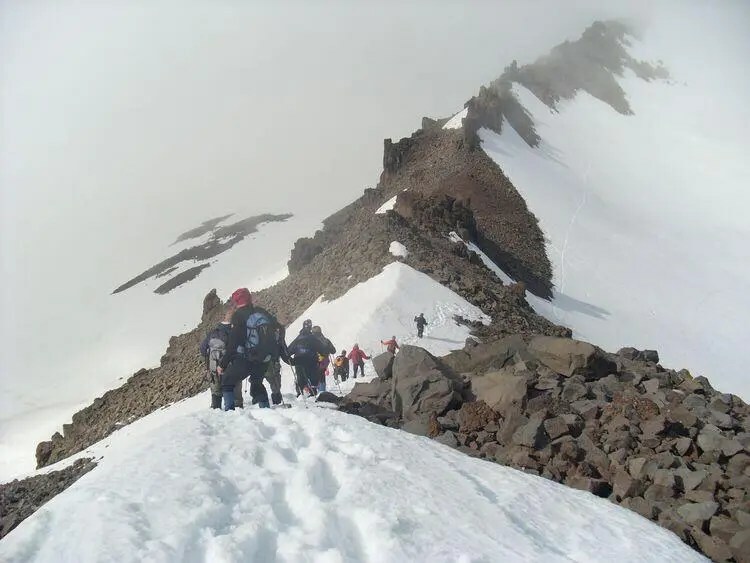 Do you want to spend some 24 hours hiking and climbing across 45 kilometers of rugged terrain of snow, semi-glaciers and loose rocks and boulders, scaling 24 peaks and accumulating an elevation gain of 4,5KM in sub-arctic conditions? If so the annual 24 peak challenge is totally your thing. Scaling the first major slope of the trip, up Mt. Hlíðarfjall. 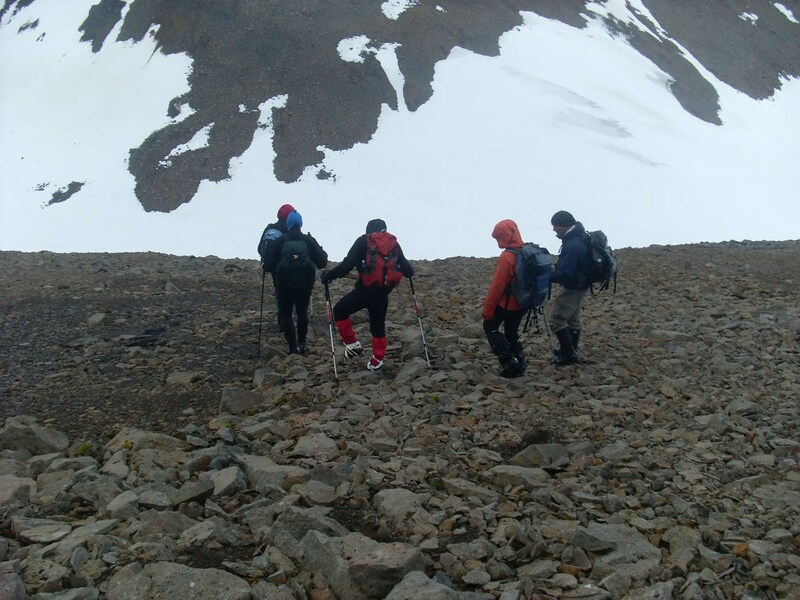 This hiking event is arranged by a group of local hiking and climbing enthusiasts in the northern town of Akureyri. 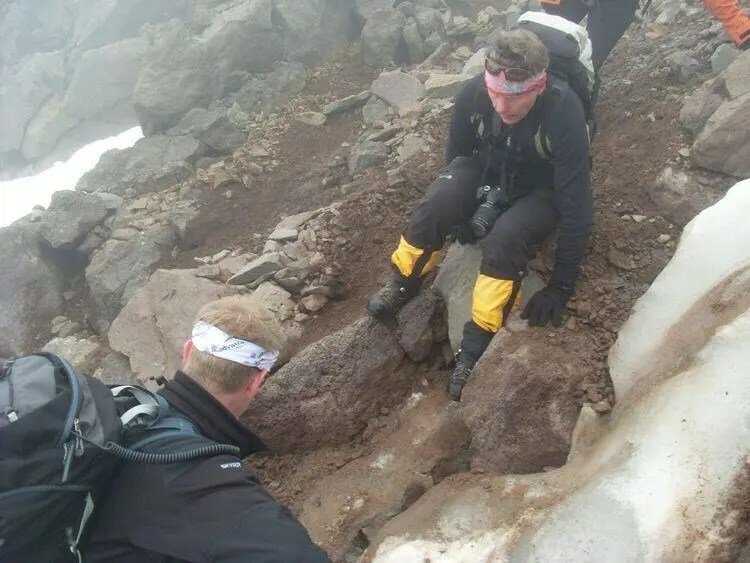 The trip involves scaling all of the 24 peaks that are above the Glerárdalur valley north of Akureyri. 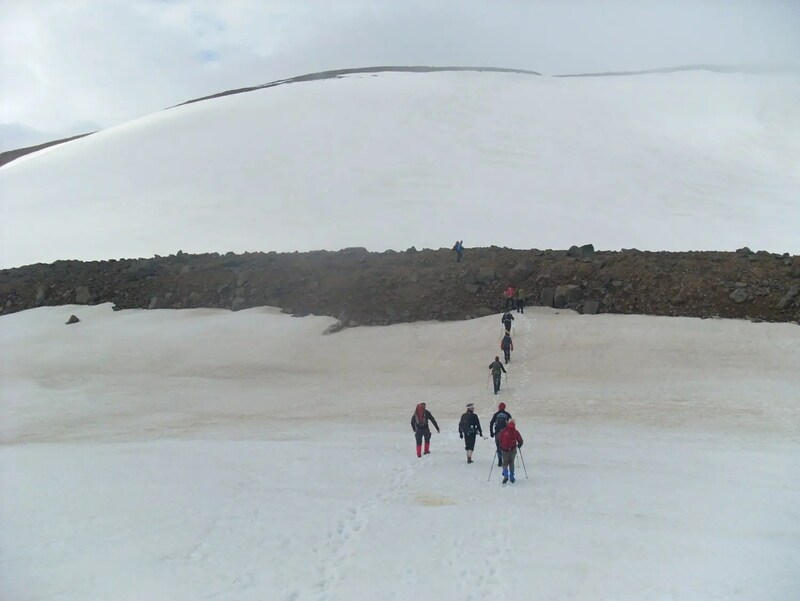 The guides told me that this trip was probably the most arduous organized hiking trip in Iceland. I leave it to others to judge whether this is true or not but at least I found it to be really challenging and a lot of fun. The main feature of the 24 peak hike is the loose boulders and rocks you encounter everywhere. I did this trip in early July 2012 on a rather short notice. My friend, who is an ex-legionnaire from the French foreign legion and an experienced climber, messaged me on Facebook and told me he was going. I took the hint immediately, we had talked doing this when our earlier treks on the Vatnajökull glacier where we scaled the highest peak in Iceland (Hvannadalshnjúkur) and the collection of peaks known as Hrútfjallstindar . So as you can see I had no choice. I packed up my gear and a lot of high calorie food. I would need it. I soon realized that this trip was not really for those who are afraid of heights or are inexperienced climbers. Nevertheless, I soldiered on and completed the trip in 26 hours. The guides that accompanied the group made sure that everything was A-OK.
Icelandic landscape is often weird and wonderful. As I said before the conditions on the way are difficult. I found scaling snow covered mountainsides easy, especially if you bring your trekking poles. All you have to do is to follow the person in front and step into their tracks while supporting yourself on the poles. 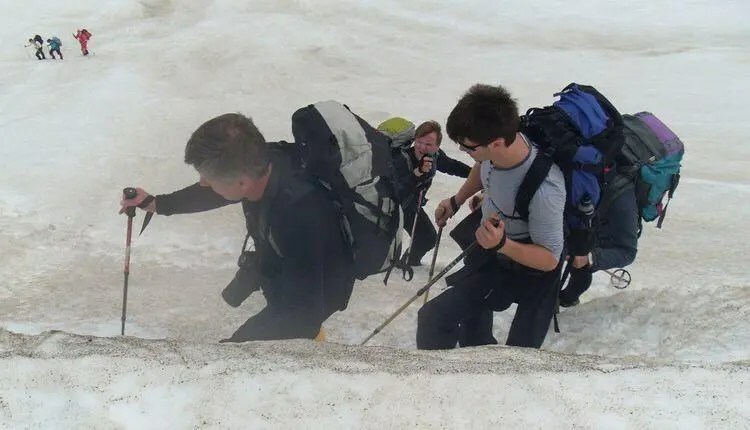 But the trekking poles become a nuisance when you reach the part of the mountainside where the it is only slippery ice, loose boulders, gravel and rocks. There you are more like a cat in drapes, looking for purchase on something, anything, that won´t slip and slide. Walking along the edge of mountains covered in snow and ice with nothing on both sides but the sheer droop is also a bit unnerving for us amateurs! Pretty early on we had to cross a sheet of ice and a stream. It turned out to be pretty easy for most people but it was difficult for some. The guy on the bottom left slipped on the ice took a tumble down the hill just a few moments after I took that picture. He saved himself from crashing into large boulders by grabbing a hold of a large rock with both his hands. The reward for all that hard work was in the form of most epic sunset/sunrise ever. As we are in the far north there is no night to speak of in June and July. The trip starts early on a Saturday morning in Mt. Hlíðarfjall which is also the site of a popular ski-resort. This is also where you gain the most elevation on the trip or some 700-800 meters. 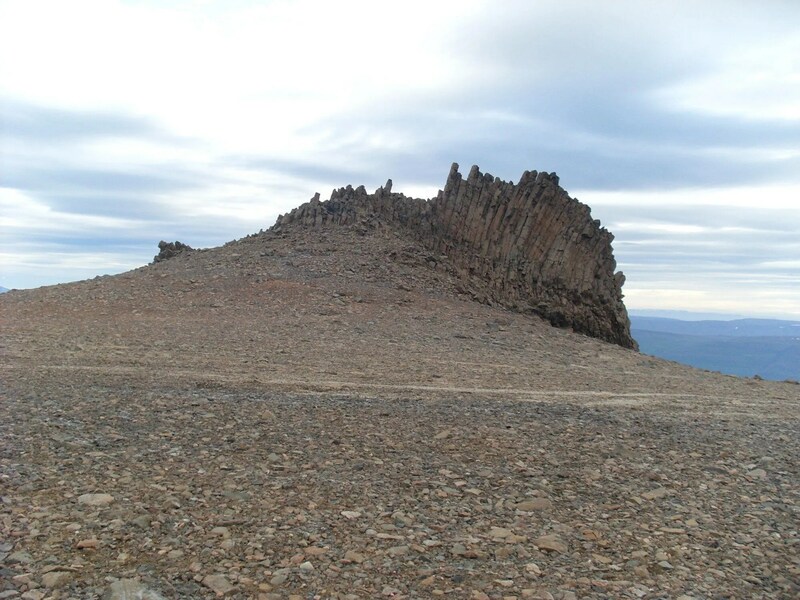 Then the route is an uninterrupted and tough task of climbing up and down 24 peaks. The highest peak on the way is Mt. Kerling (1.540M) which requires a 500M high ascend on a really steep mountainside. 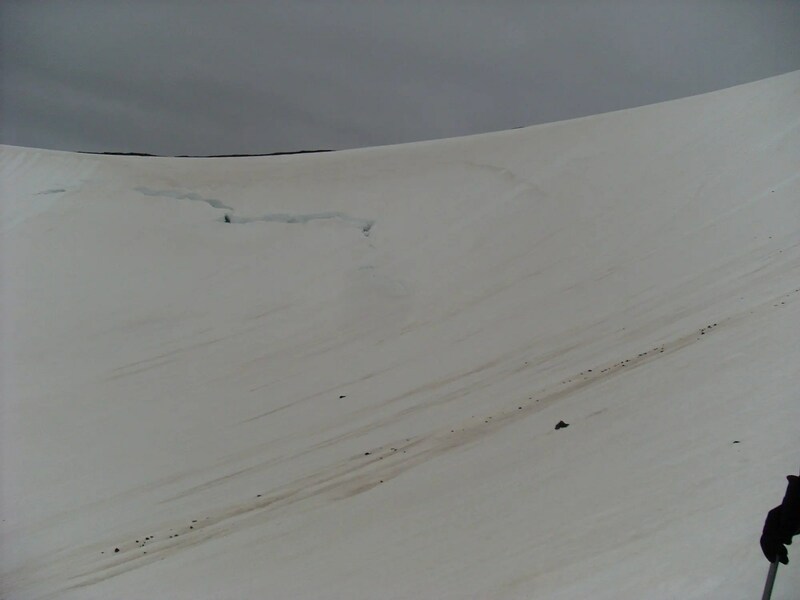 The descent was a heart-freezing “walk” down an extremely slippery snow and ice covered slope. The infamous slope down Mt. Kerling is steep. Kerling is a derogatory term for an old woman. The degree of inclination is probably around 60 degrees at the top. Going down is scary stuff. Going down I fell and started to slide down quickly accelerating. I heard myself make a rather undignified noise of fear but fortunately I was able to stop myself before Newton´s second law of motion made sure I cartwheeled into the rocks and boulders below at neck breaking speed. 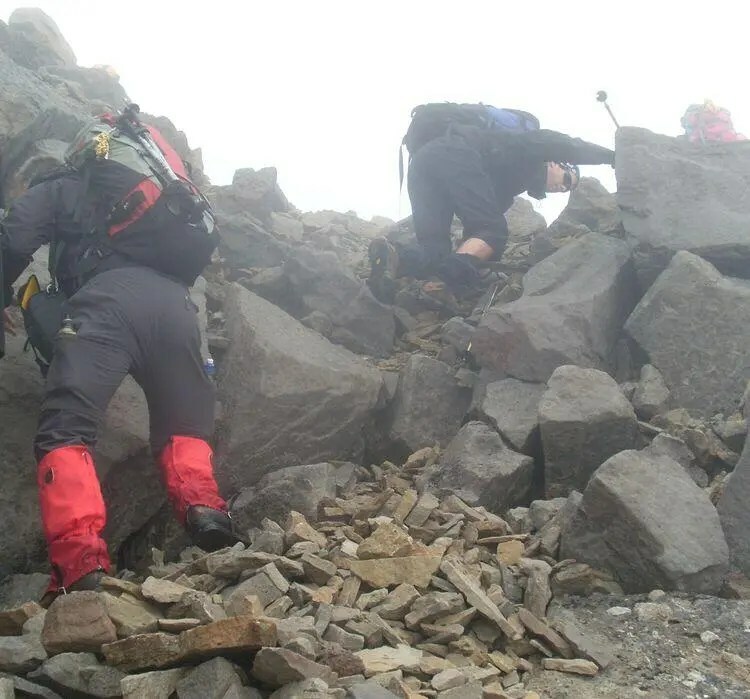 The hiking boots that one of the guys was wearing couldn´t take the strain of the rough terrain and literally fell apart. No worries, the nurse on the team had some tape and made it all right again. The weather was OK but it was foggy throughout the day. 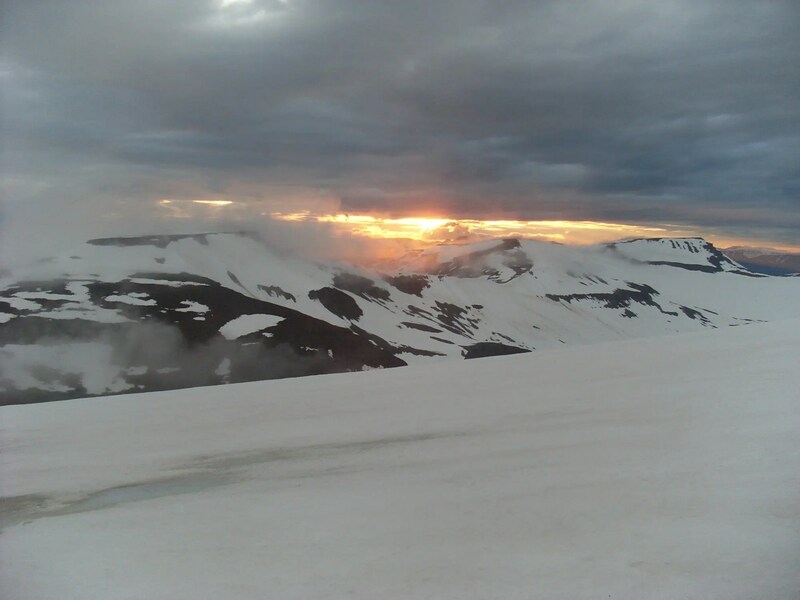 Around midnight it started to clear up and when we descended down the last peak, Ytri Súlur (1150M) it was warm and sunny. My feet were happy to leave the confines of my hiking boots I can tell you that. But it was all well worth the effort. A pretty typical view for the trip. For more information you can check out the web site for 24 peak hike event. Unfortunately, it is in Icelandic but you can e-mail the guys through this web page.